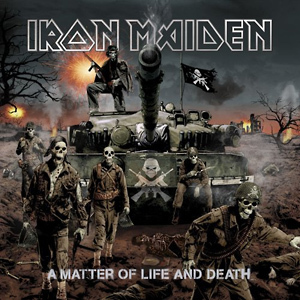 Metal legends IRON MAIDEN'S new album ‘A MATTER OF LIFE AND DEATH’ has not only been released to enormous critical acclaim across the globe but has also resulted in some of their highest chart placings ever. In addition to their Number One chart debut on the Billboard Pan-European Chart the album has now debuted at no.9 on the Billboard USA Chart on their US-label Sanctuary Records and at no.2 in Canada. This is the band's first ever US Top 10 entry in their long and illustrious history and a remarkable achievement, this being their 14th studio album. The album is also No.1 in the US Independent Album Chart. It has even crashed in at No.4 in the official album chart in India which is far and away the highest placing any heavy rock act has ever achieved in that country. Maiden's Top 10 US debut comes hot on the heels of the band's No.1 album in Europe on Billboard’s pan - European chart with nine No 1 and eighteen Top 5 chart entries in Europe alone. First week sales in the UK were also at their highest since 1990. In just the first week the new album has shipped over a million copies Worldwide and impacted on the charts pretty well everywhere in the World. Next month the band start A MATTER OF LIFE AND DEATH WORLD TOUR which takes them initially into major arenas through North America, Japan and most of Europe with the majority of the dates already sold out. They will play to over half a million fans over 44 shows in 11 weeks in 18 countries. Check out the article at The Iron Maiden website. This new album rocks! I can only hope that they come somewhere near me on their new tour. I've been listening to these guys since 1988, and if you haven't heard their music before, I strongly urge you to check them out! Be sure to check out The Iron Maiden website and Wikipedia's Iron Maiden page. You cant beat a bit of Heavy Metal,WELL DONE!.I have seen various bands here in Plymouth(UK),Judas Priest,Kiss,Wasp,Megadeth,Motorhead,Pantera,Girlschool,In Flames,Scorpions,Saxon,never seen Maiden though(unfortunately),always have excellent album covers dont they!. I'm off to see them at Earl's Court, in London, on the 27th December. You know they're gonna rock, but I'll be sure to let you know in any case.